Knowledge of Health, Inc. (March 18, 2011) – Researchers at the Eppley Institute for Research in Cancer and Allied Diseases, University of Nebraska Medical Center, now explain how an imbalance in estrogen metabolism leads to improper repair of broken DNA which in turn produces gene mutations that promote breast, prostate and other cancers. These researchers then go on to identify two natural molecular antidotes, a sulfur compound (N-acetyl cysteine) and a molecule found in red wine (resveratrol), which can completely block the initiation of these cancers. Both of these molecules are widely available as dietary supplements. When used together these antioxidants completely abolished the formation of DNA-adducts (cancer-causing chemicals that are coupled with DNA), which is the initiating step in these cancers. Women with breast cancer and men with prostate cancer, as well as men with non-Hodgkins’ lymphoma, all have relatively high urine and blood serum levels of estrogen-DNA adducts. Or estrogen-DNA adducts may be normal but its ratio to other liver breakdown molecules (metabolites) of estrogen is high. Since breast tissue can produce estrogen locally, the breast is extra vulnerable to become cancerous. This may explain why post-menopausal women who do not produce estrogen from their ovaries still develop breast cancer. Estrogen levels in breast tissue of cancer patients are 50-100 times greater than blood levels. There is strong evidence that estrogen promotes cancer. For example, when laboratory rats are implanted with estrogen + testosterone, 100% of these animals will develop prostate cancer compared to 40% when animals are implanted with testosterone only. There is even more evidence that estrogen is involved in breast and prostate tumors. A study of 2018 women found those women who consumed mushrooms in their diet had a 50% lower incidence of breast cancer than women who did not consume mushrooms. Also, the incidence of breast cancer dropped 90% among women who consumed both mushrooms and green tea. Mushrooms contain plant chemicals that inhibit the enzyme (aromatase) necessary to produce estrogen. #### – © 2011 Bill Sardi, Knowledge of Health, Inc. Not for posting on other websites. Chart shows level of cancer-causing DNA adducts when various concentrations of N-acetyl cysteine (AC) and/or resveratrol (RES) are added to a lab dish of breast cells. Unbalanced Metabolism of Endogenous Estrogens in the Etiology and Prevention of Human Cancer. Eppley Institute for Research in Cancer and Allied Diseases, University of Nebraska Medical Center, 986805 Nebraska Medical Center, Omaha, NE 68198-6805; Department of Environmental, Agricultural and Occupational Health, College of Public Health, University of Nebraska Medical Center, 986805 Nebraska Medical Center, Omaha, NE 68198-6805. Among the numerous small molecules in the body, the very few aromatic ones include the estrogens and dopamine. In relation to cancer initiation, the estrogens should be considered as chemicals, not as hormones. Metabolism of estrogens is characterized by two major pathways. One is hydroxylation to form the 2- and 4- catechol estrogens, and the second is hydroxylation at the 16α position. In the catechol pathway, the metabolism involves further oxidation to semiquinones and quinones, including formation of the catechol estrogen-3,4-quinones, the major carcinogenic metabolites of estrogens. These electrophilic compounds react with DNA to form the depurinating adducts 4-OHE(1)(E(2))-1-N3Ade and 4-OHE(1)(E(2))-1-N7Gua. The apurinic sites obtained by this reaction generate the mutations that may lead to the initiation of cancer. Oxidation of catechol estrogens to their quinones is normally in homeostasis, which minimizes formation of the quinones and their reaction with DNA. When the homeostasis is disrupted, excessive amounts of catechol estrogen quinones are formed and the resulting increase in depurinating DNA adducts can lead to initiation of cancer. Substantial evidence demonstrates the mutagenicity of the estrogen metabolites and their ability to induce transformation of mouse and human breast epithelial cells, and tumors in laboratory animals. Furthermore, women at high risk for breast cancer or diagnosed with the disease, men with prostate cancer, and men with non-Hodgkin lymphoma all have relatively high levels of estrogen-DNA adducts, compared to matched control subjects. 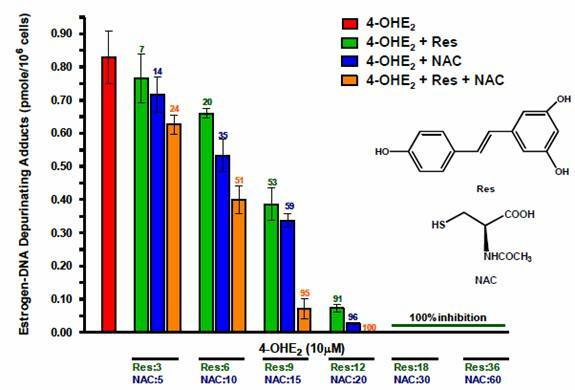 Specific antioxidants, such as N-acetylcysteine and resveratrol, can block the oxidation of catechol estrogens to their quinones and their reaction with DNA. As a result, the initiation of cancer can be prevented.